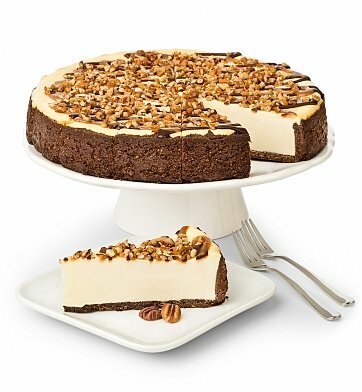 With chewy caramel, crisp pecans, and dark chocolate, this cheesecake has something for everyone. Generously sized and baked to perfection, a masterwork dessert shipped to arrive slightly chilled and ready to enjoy. All they'll need are the forks! Chocolate Caramel Pecan Cheesecake is a hand delivered gift. These gifts are delivered by one of our local design centers located throughout the United States and Canada. Same day delivery is available for most gifts when ordered before the cutoff time. The cutoff time for Chocolate Caramel Pecan Cheesecake is in the recipient's time zone.